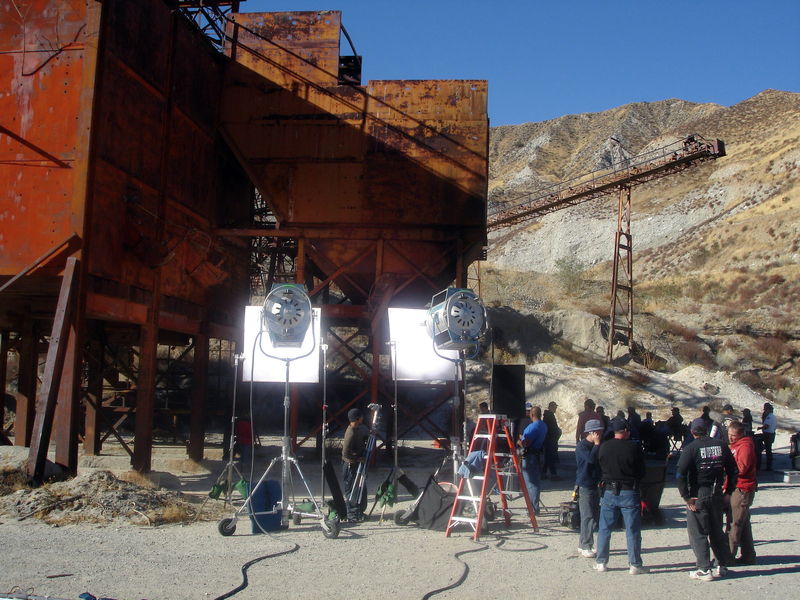 SCVHistory.com SC1705 | Film-Arts | 'Heroes' (TV Series) on Location at City's Soledad Mine Property, 2006. December 1, 2006 — NBC's "Heroes" (2006-2010) starring Jack Coleman, Hayden Panettiere, Milo Ventimiglia and Masi Oka on location at the City of Santa Clarita's Soledad mine property. The City of Santa Clarita owns 800 acres of vacant land with graded lots and old mining equipment in Soledad Canyon, just east of the historic SPRR Lang Depot site. The city purchased the property in hopes of gaining leverage in its ongoing fight to block a gravel mine and concrete batch plant on the property, as approved by the federal Bureau of Land Management in August 1990. The city now owns the surface rights, but the federal government continues to control the mineral rights. Others to use the Soledad mine site for filming are the rock band Aiden ("Moments" music video) and the Martin Donovan movie, "Duress" (2009). "Heroes" also used Golden Valley High School for at least one episode. Photo courtesy of the Santa Clarita Film Office.